Favorite Places to Study on Campus? – arts, ink. Favorite Places to Study on Campus? Which campus do you like to study at most? North Campus? Central Campus? Or do you not stay on campus to study? 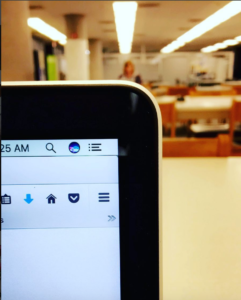 Either way, as exam season is here right before and after Thanksgiving Break, Let me suggest five great, non-obvious places to study! Arts and Architecture building (North Campus): there are computer labs, if you are in need of using a computer other than your laptop, there’s regularly a cafe cart where student groups sell hot chocolate, coffee, juice, and bagels if you want food as you study, and there are tables situated on the second floor, and some on the first (ground) floor as well! You can enjoy the scenery as you work here, and it’s usually never dead quiet (unless if you are here at 3am). Fishbowl of the M.A.T.H. Complex (aka Mason-Angell-Tisch-Haven Complex of Central Campus): there are computers here as well, and there’s many people here working of all backgrounds- architecture, Engineering, and English majors! This place is open 24/7 and is also never dead quiet! Also, there are convenient vending machines (for both food and electronics) around the corner 🙂 There are also tables and benches right outside of the Fishbowl. And if that atmosphere isn’t your thing, there’s the general Posting Wall space of Mason Hall that has electrical plugs, so if you just want a casual sit-down place that isn’t usually lonely, that’s a great place to stay! There are also random desks on each floor of any of the buildings in the M.A.T.H. Complex, so feel free to explore and find yourself a new place to study, as desired! Dana Building Commons (Central Campus): If you’re an early bird, you’ll find that this building always has a seat to welcome you! The tables here are nicely placed so you should have a plug next to you, and if you need computers, they have a computer lab on the second floor! The BBB of North Campus: This is a fun place to work in! There are several computer labs, so if you need computers, they’ve got you covered! There is also a mini arcade in the hallway, and there are also ping-pong tables in the main lobby area too! The main lobby area also has several desks and whiteboards, perfect for your individual use, or for a group setting. They also have group rooms with functioning whiteboards and projectors that you can use, if there are no reservations for it! (May seem obvious at first but…) Any of the Dorms!! Yes, on both campuses!! : Generally, any M-card should let you into the locked front doors of any of the dorms (other than if you go to dorms that have dining halls during their designated hours) before midnight. Dorms are great because usually your friends may be there, so you all can team up to study (because two brains is better than one, right?! ), or you can just study alone in any of the several lounges, or even in the dining halls- where you can just have unlimited access to cookies and tea and all that other good stuff! Alright, well, hope you found that some of these study spaces were good ideas, or even just a fun place to explore if you did not already know that they existed! Happy Studying and have a great, safe Thanksgiving Break!